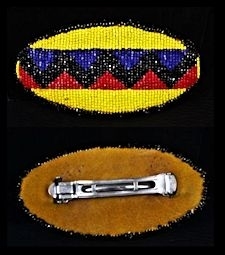 This is a one of a kind Chippewa-Cree hand beaded seed bead barrette. A fine pattern is made out of black, blue, yellow and red seed beads. This barrette has a buttery soft deerskin leather backing. 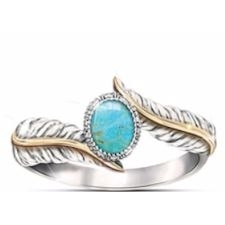 A perfect addition to your Regalia, or as a stand alone beaded barrette. This Native American made hand made beaded barrette is 4 1/4" by 2" (10.8 cm x 5.1 cm).